HA250M2W is equipped with a crawler 200mm wide. right and left fall angle and you can work safely at slope ground. Although reasonably priced' this is a user-friendly and well-equipped machine with an optimum gravity balance. Because it is compact' it is easy to turn and occupies less storage space. The gondola is equipped with a holdable hand-grip for easy entry and double-locked to ensure safety during work. The height of the step guard is adequate to make it easy for the operator to get into the gondola. The boom is hydraulic and easy to operate with a foot pedal of the gondola. It is designed to prevent a sudden drop while the boom is descending. The engine cover can also be removed when the boom is at the lowest position. Refueling and use of the recoil starter are possible without removing the engine cover. 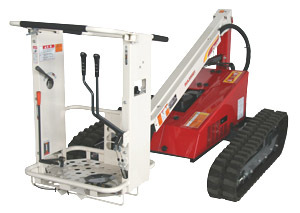 * Security design that automatically lowers the engine rpm when the boom goes above horizontal. * Wide-ranged options' such as weight' container stand' seat cover' etc. 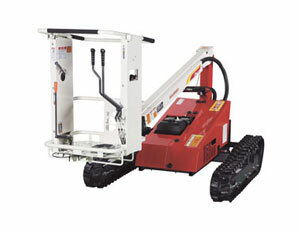 PLATFORM Maximum loading capacity 100kg / 220.5lbs. Platform height 260-2500mm / 10.2-98.4in. Moving range *1 2600mm / 102.4in. DIMENSION Total length 2440mm /96.1in. Total width 1320mm /52.0in. 1280mm/50.4in. Total weight 375kg /826.9lbs. 335kg/738.5lbs. *1 The distance is of the center of the work platform when the boom is horizontal. ●The maximum angle of inclination for use is 5 degrees.